How to make cauliflower taste amazing! 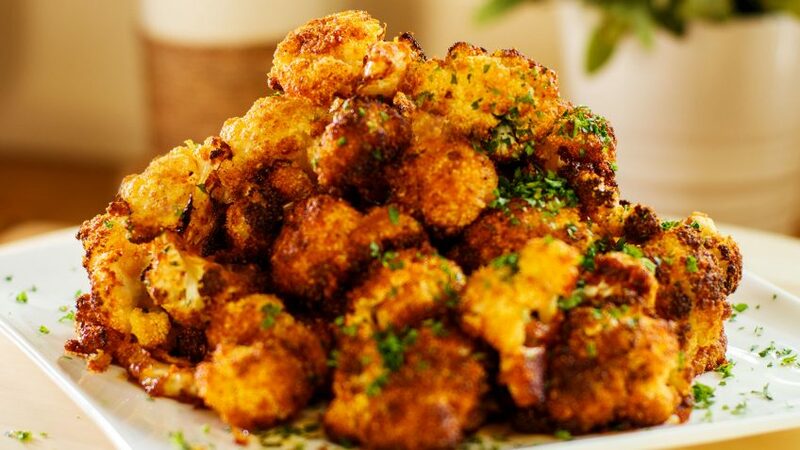 As a meal or a side dish, this is the ultimate cauliflower recipe. So simple to make and the roasting brings out those beautiful caramelize flavours. This takes cauliflower to a whole new level that will attract both vegetarians and meat lovers. Trim and wash the cauliflower. Cut into 1-2 inch florets and place in a mixing bowl. Add olive oil, salt, smoked paprika, grated Parmesan cheese, cracked pepper and breadcrumbs. Toss well until nicely coated. Add more olive oil if it’s not coating enough. Place parchment paper on a sheetpan and arrange the coated florets ensuring they are spaced apart. Place in oven and bake for 20-30 min at 400°F – 200°C. This may vary a lot so keep an eye on them. You want them a little dark so you have that slightly crunchy exterior. Serve immediately and garnish with (optional) chopped parsley.